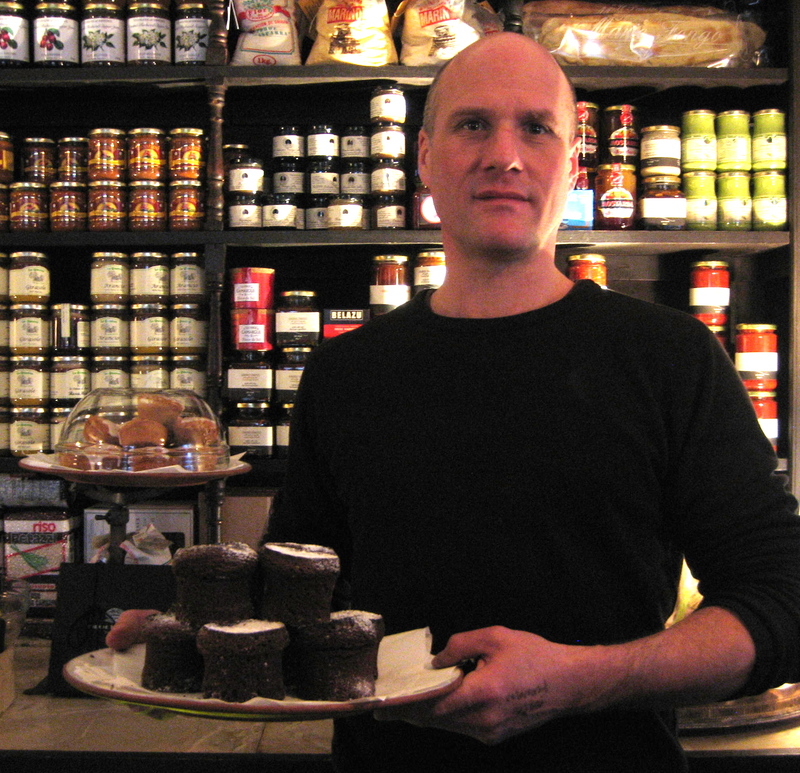 If you go round to Verde & Co, the delicatessen at 40 Brushfield St on any given Friday morning at ten, you will discover Harvey Cabaniss, the head chef and proprietor, serving the eminent Edith Randall, his most favoured and loyal customer who gets special service. “You mustn’t tell everyone about the special service” said Edith, regal in her velvet hat, when I stumbled upon the Friday ritual last week, “otherwise I’ll have rivals and that will be no good at all.” Fortunately, I know I can rely upon my readers’ discretion to maintain this best kept secret in Spitalfields – of the special service at Verde & Co – because I have no doubt it could also be arranged for you too, if you ask Harvey nicely and avoid ten on Friday mornings. What is the nature of the “special service” that has kept Edith Randall coming back, walking in all weathers from her home in the Barbican to buy her weekly supplies here every Friday at ten, since Verdes opened a few years ago? Emerging with the immaculate brio and theatrical timing of a stage conjurer, in one step Harvey appeared from the kitchen and held up a rabbit in triumph, the only difference being this rabbit was skinned and ready for the pot. Overawed at the prospect of this delicious leporine specimen, Edith clasped her hands in delight, but this was merely the overture to the performance. Harvey vanished into the kitchen again and returned with a sirloin steak, then an ox tail, delivering up a fresh box of John Dorys as his grand finale. It was an embarrassment of edible riches and with each option I could feel the rising excitement as Edith Randall rubbed her hands together in hungry anticipation of the culinary treats that the coming week held for her. 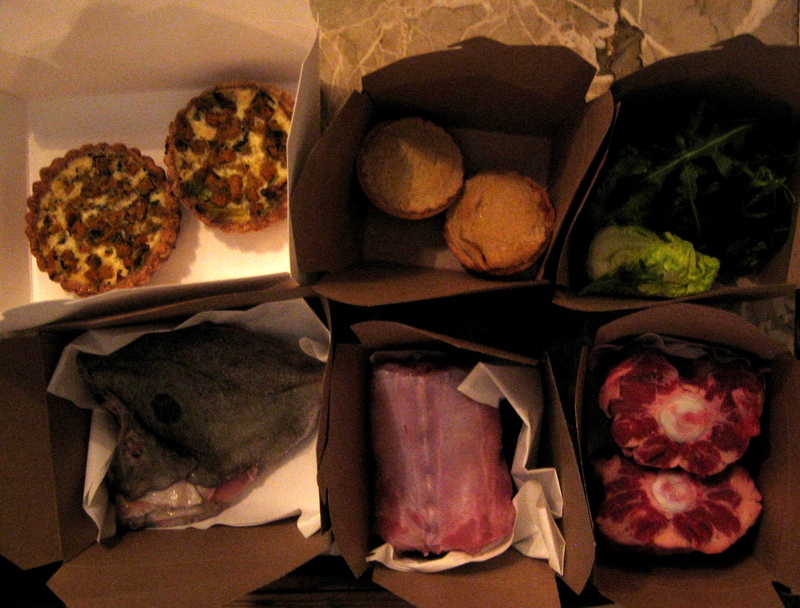 Very soon, Harvey had the pieces of meat and fish lined up neatly on the counter in boxes, supplemented by some salad, mince pies and quiches from the Sally Clarke’s famous bakery in Kensington Church St. For Edith Randall, next week’s menu was taken care of. “I’ll weigh the empty box first this week,” said Harvey catching Edith’s eye with a knowing grin. “Harvey always weighs the empty box first so he knows how much a box weighs,” said Edith inexplicably, “Sometimes, I get home and it puzzles me why there is a box with nothing in it, until I realise it is the empty box!” Clearly, this is one of those rare private jokes that can run and run, accumulating greater humorous import with further repetitions. I think we have established that Edith Randall is a female of descriminating tastes but what I have not revealed is that she is Canadian, not that these things are mutually exclusive, though it is Edith’s prerogative to disagree. “I came here from Canada in 1951 to escape from the lack of culture, I had to get out and I just simply loved it, because I had a desire to be in Europe. Even though, in 1951 everyone was going the other way and it was pretty grim here with rationing, bomb sites and flowers growing on the ruins around St Paul’s.” A graduate of the University of Canada with a passion for European literature, Edith Randall never looked back, she is at the opera almost nightly and scrupulous in keeping up with the latest exhibitions. “I killed the Turner yesterday,” Edith declared in a throwaway that is distinctly North American in its laconic irony. It is no surprise that Edith and Harvey have become soulmates in a formal, highly respectful, mutually amused kind of way, because Harvey too is a refugee from the former colonies. Coming here and washing the dishes for Fergus Henderson at his first restaurant “The French House Dining Rooms”, Harvey quickly graduated to be a chef, working with Fergus for six years before becoming head chef for the top notch catering operation run by the Caprice group. The surprising part of Harvey’s story is that he is of Huguenot origin, his ancestor Henri Cabiniss passed through here from France in 1695 before leaving for North Carolina. After three centuries, Harvey feels he has come home now. 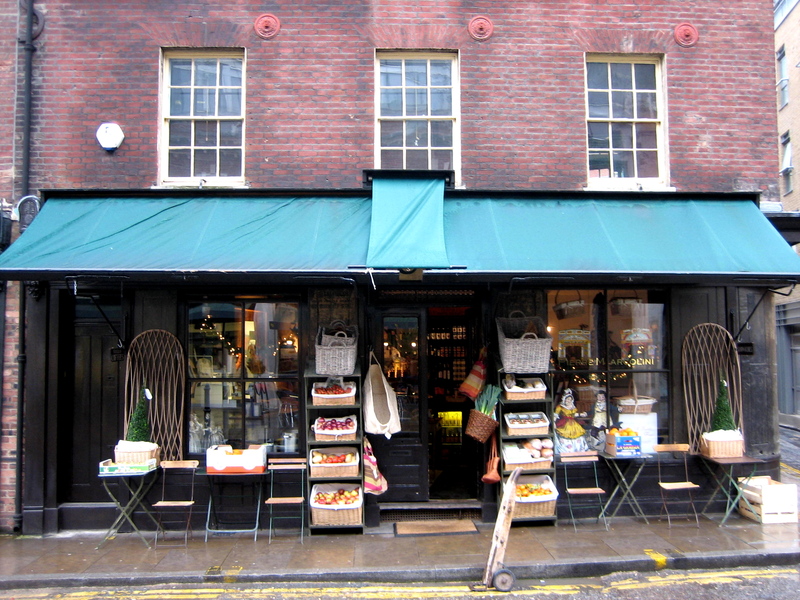 When Jeanette Winterson bought the building in Brushfield St and renovated it, she wanted to lease the shop to a grocer and Harvey took it on. Retaining all the charm of the quaint old premises, enhanced with a fine display of antique china, Staffordshire figures, toy theatres and nineteenth century clocks, Harvey has stocked it to the roof with his favourite foods.“The best things you can buy in London,” he terms it simply. Sometimes, I have noticed that oranges are the only fruit on sale here and I always wondered if this was a subtle joke at the landlady’s expense, but I was too shy to ask. Just like the planets in the heavens, Harvey is in a constant state of motion. Even as I took the photo above, I was aware that he was poised, about to run off to the next task. A tall man with agile grace and a powerful physical presence, who lifts his head up to look you in the eye, I should not have been surprised if, like Nijinsky, Harvey was capable of spectacular leaps, though maybe this would not be especially practical or entirely advisable in such a tiny shop crammed with pots of jam stacked up and valuable antiques. Your blog is just SO interesting. Thanks for giving us all a glimpse of what life is like in Spitalfields. My partner and I are off to London for some meetings & some fun for 12 days in February. We’ve been wanting to explore the Spitalfields area, and now that I’ve browsed your blog I am even more inspired. If you woke up this morning in the mood to do a generous act of kindness for a stranger, would you suggest a Spitalfields mid-priced holiday rental flat or hotel where we could stay and eat our meals at Verde & Co? Thank you and many happy days in Spitalfields. How kind of you! Your suggestions are wonderful. The house in Princelet Street would have been perfect for us. Unfortunately we have left it too late and neither the house nor the hotel are available while we will be there. But I enjoyed the process of discovering them online very much. And that process is the beauty of your blog. Reading your blog from start to finish (on the advice of a friend), and enjoying it greatly! Although as a Canadian I feel I must point out that dear Edith is pulling your leg – although there are a great many Canadian universities, there is no such institution as “The University of Canada”. stamatia, we will have lots to talk about tomorrow when we get together – maybe we need to visit spitalfields together then! I’d simply assumed that as often happens in up-scale deli’s and markets, the clerk/seller weighs the empty box first, then subtracts the weight of the box from the total weight of food and box, so the customer pays only for the food. Then, I imagine, since both Harvey and Edith are imaginative, creative sorts, the empty box took off and sprouted a life of its own. I add that I live in North Carolina in the States, and Harvey’s from the States. Maybe the empty box syndrome is a Stateside phenomenon…At any rate, your blog is a gift. I’d love an encounter with Jeanette W if there’s one to post! The coffee at Harveys emporium is my favourite. Have the exuberant luxury of deciding between the white sugar cubes or brown sugar cubes : ) Harvey is a great down-to-earth hard working guy who is a pleasure to work for. I´ve had that privilege. Once commented to Jeanette W why she doesn´t write real books similar to the likes of Tom Clancy and she replied something most hilarious. It made my day! My first interaction with her left a good memory. Tracy Emin also sometimes hides away in Harveys emporium under his watchful eye in blissful anonymity sipping on lemon tea. Bravo to you for such a terrific website! For years I’ve delighted in reading about Spitalfields and it is always a pleasure to see articles on Harvey Cabaniss as well as Tim Whitaker. I love their aesthetic and they have worked passionately to beautifully embellish their lives and neighborhood (forgive my effusiveness…I’m floating on a Sunday morning in Oregon filled with thoughts of the beauty of England). I will look forward to a visit (sooner than later) to this emporium as well as other Spitalfield’s pleasures. HAPPY BIRTHDAY TO HARVEY FROM A VOICE IN HIS PAST! !